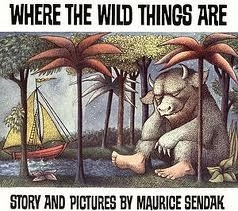 Prolific children's author, Maurice Sendak died yesterday. He is best known for Where the Wild Things Are, a picture book which has never been out of print since its publication in 1963. As I wrote on the 6th grade eboard, the predecessor to this blog, I use that book with my students to model endings, as I think Mr. Sendak crafted perhaps the most comforting last line of a children's book, ever. How comforting is it to think that after all his wild adventures, when Max wants to be where he is loved best of all, he "sailed back over a year and in and out of weeks and through a day and into the night of his very own room where he found his supper waiting for him (page turn) and it was still hot."